The operating room is assembled in a similar manner as for any laparascopic procedure. Equipment used in hand-assisted cases versus pure laparascopic cases is similar as well. Two important instruments exclusive to hand-assisted surgery include a ringless laparotomy pad and the hand-assist device. A clean, rolled up laparotomy pad with the ring removed is placed into the abdomen through the hand incision. The laparotomy pad is used to help retract and dry tissues. Drier tissues are easier to grasp and dissect, and tissue planes are easier to identify. It also saves time not having to stop and insert a suction/irrigating instrument. If the laparotomy pad becomes excessively bloody it can absorb a significant amount of light, which can darken the video image. Replacing a bloody laparotomy pad with a clean one can dramatically brighten the video image. Each device has its advantages and disadvantages. Factors determining the ideal choice of a hand-access device for a specific case include the patient's body habitus and pathology, and the surgeon's experience and preference using each individual device. All devices require similar-size incisions (3-4 in) in the abdominal wall, but vary widely on how these maintain a seal around the surgeon's arm and wrist. Unlike the first-generation devices, none of the new products adhere to the body wall using adhesive seals. These adhesives seals were tedious and difficult to apply and were very prone to leakage. Devices that are currently on the market include Gelporta, Lapdiscb, and Omniportc. All of these devices secure to the body wall using two concentric rings that are attached together with vinyl or rubber. One ring is inserted on the undersurface of the abdominal wall and the other ring rests on the outside surface of the body wall. The material holding the two rings together is placed on stretch, maintaining the seal at the body wall and acting as a wound protector. These second-generation devices can be directly inserted into the abdominal cavity without first insufflating, which is a definite time saver. Advantages of the Gelport (Fig. 2) device include an excellent seal, flexibility, and comfort offered by the gel. The unique gel-like polymer through which the aApplied Medical, Rancho Santa Margarita, CA. bEthicon, Cincinnati, OH. cIntermed, Selling, NV. FIGURE2 ■ Gelport device. Source: Courtesy of applied medical. FIGURE 3 ■ Lapdisc device. Source: Courtesy of Ethicon. FIGURE4 ■ Omnport device. Source: Courtesy of intermed. surgeon's hand is inserted is flexible and soft around the wrist. Additionally, this polymer can be temporarily pierced by an instrument or trocar and maintain a seal at the puncture site. Instruments can even be inserted through the gel while the hand is inserted in the device. Other advantages include the fact that removal of the surgeon's hand from the abdominal cavity does not cause loss of pneumoperitoneum and rarely causes the device to become dislodged. The Gelport device has the largest template or footprint, requiring a large area for application. This is not a problem in most cases, but in small-framed patients the device may be too large to use in a right lower quadrant incision that is commonly used for a right-sided nephrectomy. In these cases, the anterior iliac spine may prevent the device from sitting evenly against the body wall, thereby jeopardizing the seal. A smaller version of this device has recently become available to obviate these problems. Gelport is the most expensive hand-access device on the market. The Lapdisc (Fig. 3) is the least expensive device on the market and is the easiest to use. There are no pieces that need to be assembled, and insertion of the device is quick and easy. This device has the smallest footprint, fitting almost anywhere on most abdominal walls and rarely interferes with adjacent trocars. An oversized device is available for patients with thicker than normal abdominal walls. The iris that tightens around the surgeon's wrist, to develop the seal, can alternatively be tightened around a trocar or completely closed on its self to maintain the pneumoperitoneum. This iris requires meticulous adjustment around the wrist. If it is too tight the hand will quickly tire and become painful, if too loose, the device will leak. When removing the hand from the abdomen the iris must be adequately loosened or the Lapdisc will inadvertently be removed. Pneumoperitoneum is lost when the hand is removed but can easily be reestablished by quickly closing the iris. The Omniport (Fig. 4) is an inflatable device, which maintains an excellent seal and rarely becomes dislodged once it is inserted. As with the Gelport and Lapdisc, the surgeon's hand can rapidly be removed and reinserted, which is a major advantage for resident teaching programs when the teaching surgeon must quickly take over the case to avert or manage a potential complication. 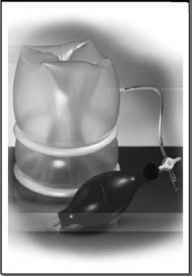 The device can be insufflated to maintain pneumoperitoneum without the hand being inserted, but an accessory trocar or instrument cannot be inserted through the device. Unfortunately, the device can be difficult to insert. Additionally, care must be taken to assure that bowel or omen-tum is not caught under the rigid inner ring, which is unforgiving and can easily damage soft tissue. As with all forms of minimally invasive surgery, products will continue to change and improve. It is not practical or cost effective for any one operating room to have all products available. Surgeons performing hand-assisted laparoscopic should periodically evaluate the hand-access devices available and select the one or two devices they feel are best suited for their needs.